Non Omnis Moriar: To Know Away Your Freedom? To Know Away Your Freedom? I have always been fascinated with the nature of God’s attributes or at least the attributes we commonly assign to God (whether or not He actually possesses them notwithstanding). In fact, a large portion of the philosophy of religion is dedicated to discussing these attributes and their suspected logical inconsistencies. One particular issue among the pantheon of issues is the question of whether or not God’s foreknowledge is compatible with human free will. That is to say, if God knows exactly what you are going to do before you do it, are you really free in respect to the action? If God knows what action you are going to perform before you choose it, are you not then logically determined to do that action? Let’s look at some trivial action like, say, God knows that you are going to pick your nose in private tomorrow at 12:32 PM. Now, if God knows that you will pick your nose at 12:32 PM tomorrow, we must also affirm that it MUST be the case that you pick your nose at 12:32 PM tomorrow. And of course, if it must be the case, you have no possibility of refraining from the action of picking your nose and thus can in no way be said to be free in respect to the action of picking your nose tomorrow at 12:32 PM. If God is truly omniscient, he knows all the actions you will perform ever and totally, meaning that you must perform all the actions that God knows and thus are not free in respect to any of the actions you perform! This is theologically dangerous and in observable discord with other theological doctrines we often hold as true (e.g. God’s perfect goodness). If this is true, then we have a fundamental problem with respect to holding both God’s foreknowledge of future events and the free will of human beings as simultaneously true. 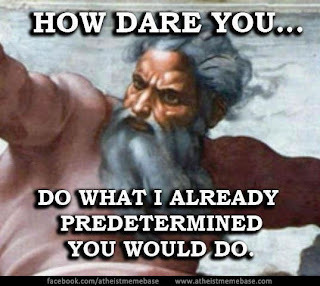 If the above argument is sound we must do one of three things: (1) be willing to irrationally affirm a contradiction of terms, (2) dispense or redefine omniscience (God’s all-knowing nature), or (3) dispense with human free will (as a significant branch of protestant theology does in fact do). Those who would affirm (1) are perfectly comfortable with a God who exists outside the scope of logical principles (like early Rene Descartes) and thus openly embrace theological paradoxes, tension and blatant contradiction (I for one know a professor of this persuasion). Unfortunately, any reasoning with persons in the aforesaid group is utterly impossible as all meaningful conversation necessarily depends upon the existence of logical uniformity. Many would argue that (1) is simply an incoherent position and is thus typically just ignored (as I will ignore it now, though perhaps not judiciously). This stretches God’s omniscience further than even traditional notions, as it dictates that God does not only know all past, present and future states of affairs, but also all states of affairs that COULD have been had any given event been different. All things that could have been but are not actually are known as counterfactuals. The problem that this presents to the open theist position is that these counterfactuals exist in the same way that future events do—inasmuch as they do not exist but God still somehow knows them. Unless a substantive difference can be shown between counterfactuals and future events, we have no more reason for believing that God does not know future events than we do counterfactuals. In the third group, one is committed to denying the existence of libertarian free will. There is no contradiction with God’s foreknowledge if we simply reject the notion of free will and accept a form of fatalism or determinism, wherein all actions of a person are determined by some prior state of affairs. Many Calvinistic individuals or those of a more Augustinian background reject human freedom in their hyper-emphasis of God’s transcendent sovereignty over humanity. (P1) If God knows that tomorrow you will perform action X, then you must perform action X tomorrow. (P2) If you must perform action X tomorrow, then you have no freedom to refrain from action X. (C) It follows from (P1) and (P2) that any actions that God foreknows renders you, or any subject that can be replaced by you, not free in respect to those actions. This seems right. But as the famous Christian Philosopher, Alvin Plantinga has pointed out, it is based on confusion. (P1) can actually be read two separate ways that yield two entirely different meanings. The difference is slight so pay close attention. (P1), call it here (P1a), can mean that if God knows you will perform X then it is necessary that you perform X. That is to say, the outcome is necessary such that it could not have been different. (P1a) is what must be true in order for the conclusion to follow. But there is an alternative, call it (P1b). (P1b) says it is necessary for what God knows to be true. So if God knows you will perform action X tomorrow, you will. This is more trivially true, inasmuch as it is true not just of God, but of anybody who knows things. If I know that Paul is a bachelor, it will be the case that he is a bachelor (or I did not know it). The difference is that it is not necessary for Paul to be a bachelor, he could in fact be married if he so wished (in which case I would instead know that he was married). So the difference rides on the idea that though it is necessary for what God knows to be true (which is true of any subject capable of knowing things), it does not mean that what he knows is necessary.Thus, God knowing in advance what action you will perform does not make that action a logically necessary one, wherein you could not refrain. 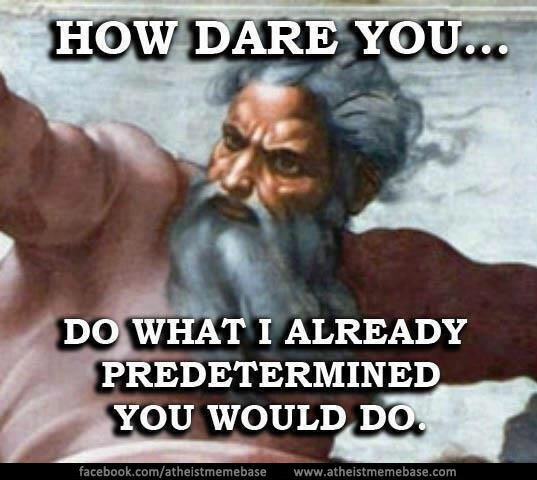 It instead shows that God knows the outcomes of freely willed actions. © Max Peccator. Simple theme. Theme images by gaffera. Powered by Blogger.